The K2017 cold water electric pressure washer, producing 1,600 PSI at 1.7 GPM, is for industrial and commercial use; perfect for the professional who cleans hotels and buildings, does auto detailing, HVAC maintenance, screen printing, washes boats, or vehicles. What distinguishes this KrÃnzle unit from the competition are the unique capabilities of the KrÃnzle pump and the uncompromising German quality. The KrÃnzle pump can run dry and bypass longer than its rivals, making it more durable and reliable than the competition. The K2017, designed for daily use, is equipped with a KrÃnzle APG industrial grade pump, rated number one in independent laboratory tests. It is powered by a KrÃnzle 110 volt, 15 amp TEFC electric motor with 35' cord and ground fault interrupter (GFI). This pressure washer self primes and is freeze proof. 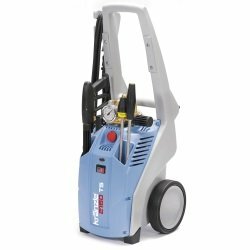 Featuring a steel frame with a plastic cover that holds the accessories, this pressure washer provides a convenient and powerful cleaning package. The K2017 comes with all the accessories you need to include: professional gun-jet lance, 33' wire braided hose, gauge, safety coupler screw connections, an industrial Vario-jet (high pressure wash/soap) nozzle, and for difficult to clean dirt, a hard hitting Dirt Killer turbo nozzle. With a cleaning power rating of 2,720 cleaning units, the K2017 cold water electric pressure washer provides a lot of cleaning power in a small package. Measures: 37-inches length by 16-inches width by 16-inches height. Weight: 85 pounds. Metal and plastic finish.